Tickets Start At $49. Prices Subject To Change. Set against the backdrop of 19th-century France, LES MISÉRABLES tells an enthralling story of broken dreams and unrequited love, passion, sacrifice and redemption – a timeless testament to the survival of the human spirit. Featuring one of the greatest scores of all time, with thrilling and beloved songs including “I Dreamed A Dream,” “On My Own,” “Stars," “Bring Him Home,” “One Day More,” “Do You Hear the People Sing?” and many more, this epic and uplifting story has become one of the most celebrated musicals in theatrical history. Along with the Oscar-winning movie version, it has now been seen by more than 130 million people in 44 countries and in 22 languages around the globe. LES MISÉRABLES is still the world’s most popular musical, breaking box office records everywhere in its 33rd year. 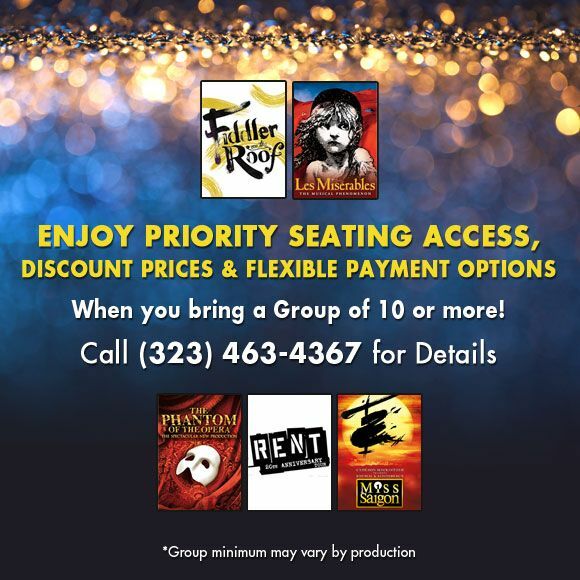 Click your desired performance to purchase tickets in our ASL seating area. Click your desired performance to purchase tickets in our open caption seating area. Click your desired performance to purchase tickets online. This service may be utilized from ANY SEAT. Visit Audience Services to check out a listening device at no cost by leaving a driver's license or other ID. Simply set your device to the Telecoil feature, and adjust volume accordingly. We also offer a limited number of T-coil loop receivers for patrons with no personal device. Email is the best way to reach us. Please allow at least 2 weeks advance notice when making a request. Recommended for ages 10 and up. Children under 5 will not be admitted to the theatre. All patrons must have a ticket.